I am a Maruti vehicle owner, and a highly satisfied one at that. The overall cost efficiency of their vehicles and the tremendous value they provide is legendary. It is aptly shown in that funny ad in which a rich man is being sold a luxury ship by a sophisticated salesman, and at the end of it he coolly asks – “Kitna deti hai?” Maruti can take the credit for (or is guilty of – based on how you look at it!) making Indian car owners used to a certain minimum standard of fuel efficiency. And that sort of dependability (and many other benefits that car owners attribute value to and which Maruti has mastered) tends to tilt the car buyer’s decision in favor of Maruti more often than its competitors – at least on Indian roads. In a very conscious or unconscious way, customers assign a value to their purchase, and compare it to the price at which it is being offered, and if the gap is there – they seem to go for the purchase. In my profession (technology and management consulting) often I am required to sell our offerings to other companies using what is commonly known as “Preparing a Business Case”. In most cases, the approach taken to create a business case is what I broadly like to refer to as the ‘route of efficiency’ rather than the ‘path of effectiveness’. And the reason for it is simple: it is easier to quantify efficiency, and very tough to quantify effectiveness. So for whatever it is worth, one goes about getting some numbers around how much time will be saved due to automation, or how many man hours will be saved due to process time reduction, or how much material will be saved due to lesser turnaround time. Despite that exercise (which has its own value), I have often experienced that companies that finally end up buying do not do so, only because of the price justification in the business case, but due to some additional value perception that they see. That value perception often means different things to different customers in different circumstances, but unless that happens, the business case alone is not enough and the sale does not happen. And in a competitive environment, that value perception is the ‘thing’ that tilts the customer to choose a seller. 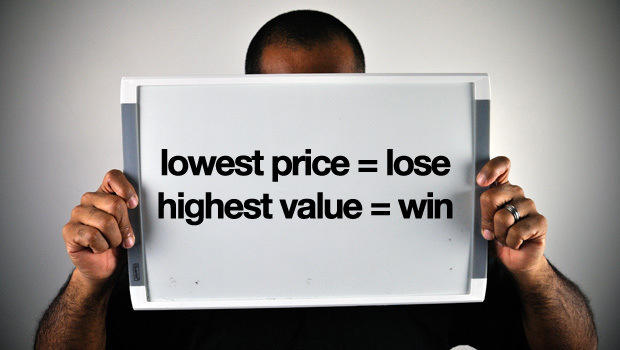 It is easy to offer a price, but very difficult to quantify that value perception. Companies that can consistently offer this value relevant to their markets, and whose customers choose them for this intangible value perception are themselves candidates for outstanding long term value. As customers of various products, we are exposed to offers on multiple things at multiple prices everyday. As prospective customers, most of us are smart enough to evaluate the value in what is offered, then check the price, and if there is a gap, we grab it with both hands. A lot of ‘up to 30% off’ offers are simply stripped down products at slightly lesser prices, and most of us, after checking on them – reject those kind of offers. Some of them are genuine ‘sale’ offers or turn out to be great bargains, and we are smart enough to recognize those too. But as investors, a lot of us are not that smart when choosing company stocks to buy. We forget that price is one factor, but whether the company is of value is the important one. A new promoter tries to sell part of his company which has just started making profits (an IPO is just that! ), but we still buy it even when an established company is available for purchase every day – perhaps because “it is cheaper”. We see on business channels, the reporter routinely making statements like “retail investors seem to have come back to the market as there is more action seen in mid and small cap stocks” – thereby meaning that they buy the stocks that have lower price. A friend of mine ‘invests’ in penny stocks because “it is 12 rupees, so even if it moves by 10 rupees my money will almost double”. Another acquaintance never understands why buying a 10-year-old mutual fund unit costing Rs.200 per unit is better than buying in a new fund offer for Rs.10 – “I am getting 500 units for Rs.5000 in the new fund”. It is almost like going to a grocery store and asking for a soap for under Rs.5 – well you may get a soap, but it is not going to wash anything much! That is not to say that there is no value in low-priced stocks. Like bargains for any other product, there could be, but price cannot be the sole reason of purchase. It is best if the starting point of any purchase is at least a broad evaluation of what constitutes value for you. When the value seen is reasonably close or under the price at which it is offered – be it for someone buying cars, software or company stock – it results in a good purchase. But a great purchase is perhaps made, when you not only get some of these quantifiable measures of value, but also know that there is some more value offered that is pretty certain and perceived, maybe not easily quantifiable and replaceable. The kind of value you have when you know that customers in India prefer Maruti cars for some reason. Or that it is almost impossible for someone even with a lot of money to replace Cadbury or Disney from a child’s mind. Or Americans for some reason love Coke. That is when you know that when such value is available cheap, it is not a “up to 20% off, conditions apply” kind of sale, but a genuine bargain on a quality product. Buffett said that price is what you pay, value is what you get. The ability to get this difference is critical. Else like Oscar Wilde said we will “know the price of everything and the value of nothing”.